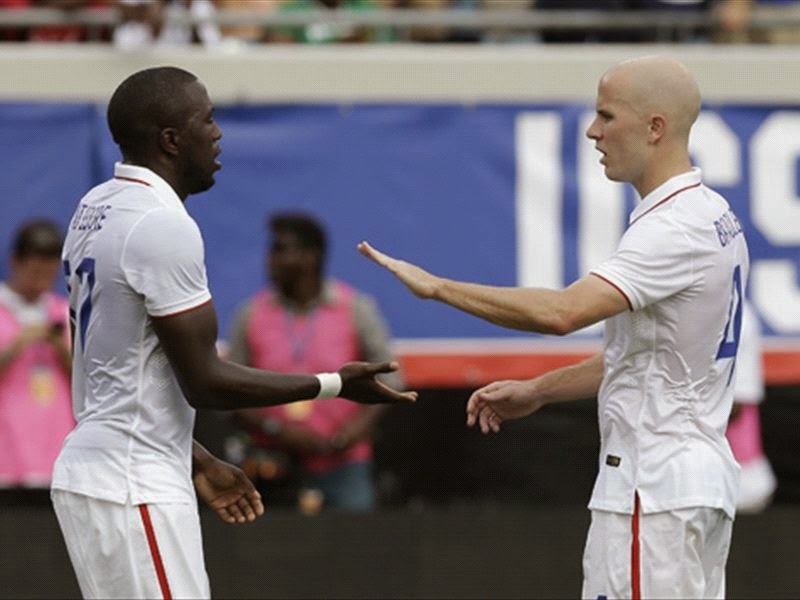 Jozy Altidore scored a brace today versus Nigeria in the final send-off game before Brazil 2014. It was a significant moment not only for Jozy but for the whole of the team. Now their starting striker is back in scoring form and Michael Bradley is the provider. Michael Bradley remains the key. He was always a fulcrum for his father, Bob Bradley, but years of playing at the highest level in Europe have made him a world-class player. Klinsmann's genius move to try a 5-man midfield with two holding mids behind Bradley allows him to be a creator, a number 10. There were at least 10 such moments of true magic from Bradley. He created the chances, the spaces, the game. Most of his passes get through, but it's the chippy ones, the blind crosses, the small moves that make the magic. He is a complete player. But Bradley wouldn't be here if it weren't for Beckerman and Jermaine Jones. In effect, Beckerman has substituted Bradley's place as a holding midfielder and relieved Toronto's designated players of a crucial duty: defense. Make no mistake, Bradley won quite a few balls on his own today. But it was the space and time left for his creativity that stole the show. That's what Beckerman's role did. The defense is set with DaMarcus Beasley at left back. Chandler's communication with Besler just wasn't there versus Turkey or today. Omar Gonzalez is also behind Cameron at the moment as a center back. Hat's off for a great performance by Cameron. So Klinsmann has his formula now. Bedoya, Zusi and Brad Davis seem to be interchangeable. That is probably where the change might come versus Ghana June 16. But as the commentators said during the broadcast, Bedoya brings the defense. Against Ghana, all the defending possible will be required.